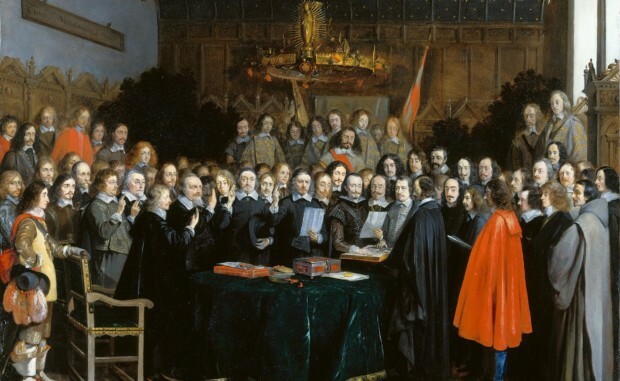 Image Caption: Although many point to the Peace of Westphalia as the starting point for the modern framework relating individual rights with sovereignty in international law, the narrative is in fact more complicated and may require a more nuanced look at history beyond 17th century Europe. Hersch Lauterpacht, the principal legal architect of crimes against humanity, once said that “the individual human being is the ultimate unit of all law.” While it has been true throughout history that law governs the behavior of society and thereby regulates what individuals can and cannot do through the imposition of consequences for certain actions, individuals were not, and indeed still are not, the central unit of analysis in international law and relations. The development of human rights as an international legal norm, however, has brought individual rights far closer to the foreground of analysis, increasingly so with respect to questions of humanitarian intervention and sovereignty. Whether or not human rights fundamentally undermine sovereignty has become a central question in contemporary international relations literature. How has the shift in emphasis from the protection of collective to individual rights in international law affected modern conceptions of sovereignty and its limits? To answer this question, this paper will trace the development of rights in international relations and the corresponding impact on normative understandings of sovereignty and justified intervention. First, it will discuss the focal shift from collective to individual rights and its reflection within international law. Second, it will examine how the changing structure and unitary focus of rights coincided with and informed the transition from personalized or dynastic to depersonalized or popular sovereignty. Finally, it will identify how these altered conceptions of rights and sovereignty have modified what is considered a legitimately justified intervention. It will apply this perspective by contending that the emergence of the Responsibility to Protect (R2P) and other international principles which endorse intervention for the protection of citizens, rather than solely to counter state-to-state aggression are a part of a broader normative shift within international relations in which international legal sovereignty is becoming increasingly contingent on individual rather than collective rights. Identifying a transition from collective to individual rights has become a popular explanation for the historical development of human rights. This narrative can occasionally be misleading by implying that recognition of individual rights in international law was perhaps formerly non-existent. Reality is more nuanced. An evaluation of the development of rights through the lenses of collectivism and individualism is better envisioned as movement along a spectrum rather than an emergent dichotomy. The inclusion of individual rights within international law is not a new phenomenon; however, with the transition from dynastic to popular sovereignty, individual rights have attained the greater normative focus and gained more substantial enforceability through the expansion of global governance. In international relations literature, the narrative of rights and sovereignty often begins at the conclusion of the Thirty Year’s War and the ratification of the Peace of Westphalia. At this time and place, sovereignty was dynastic and, therefore, rights were both determined and guaranteed by the sovereign, and they tended to apply to the collective of the nation-state. This is exemplified in Westphalian provisions on religious rights, which granted the territorial ruler or sovereign, rather than the Holy Roman Empire, the right to choose the religion of their subjects. However, the preeminence of collective rights was not absolute; the Peace also guaranteed those subjects freedom of conscience and the right to emigrate or practice in neighboring countries. Importantly, this indicates that “the endorsement of individual rights at Westphalia limited state sovereignty” by restraining the powers it then encompassed. In the centuries which followed, marked by religious upheaval as well as the rise of enlightenment ideals, individual rights became a matter of increasing contention in political life across Western Europe and eventually, of import to both the American and French revolutions. There are countless rhetorical similarities between the Declaration of Independence and the Declaration on the Rights of Man and the Citizen which are also later shared by the Universal Declaration of Human Rights (UDHR). The most prominent of these commonalities is their focus on the individual citizen and description of their rights as intrinsic, inalienable, and fundamentally linked to freedom and security. This concentration on the rights and empowerment of individual citizens seems a byproduct not only of the intellectual climate of this era, but also those who were represented in the ‘rooms where it happened’. It was la troisième état, comprised by the popular majority, that formed the National Assembly which drafted the Declaration on the Rights of Man and the Citizen. Similarly, the American Declaration of Independence was written by citizens appointed by a Congress. Each of these events and their respective declarations mark critical moments for the historical transition of the authority to define and enforce rights from dynastic leaders to their citizens. By consequence, individuals became the primary subjects and guarantors of rights. In a global context, the shift in emphasis from collectivity to individuality in the structuring of rights allowed for the formation of rights that by nature of being centered on individuals rather than states, transcend national borders and apply globally. This is facilitated by the concept of universality, which figured in discussions of rights even significantly predating the advent of human rights. Themes of universalism are present throughout religious texts, including the Ten Commandments of the Abrahamic faiths, as well as ancient legal frameworks including Hammurabi’s Code. These historic examples among others in fact informed UNESCO respondents and members of the UDHR drafting committee, the Commission on Human Rights. The development of universal human rights was emblematic of a reconstitution of the international community from focusing on the rights of individual states or nations to developing a global community with shared rights which is inclusive of many more stakeholders such as individuals and organizations. Despite more pessimistic accounts which view human rights principally as a tool of Western states to enforce their desired order, the drafting of the UDHR did in fact draw from a culturally diverse set of sources. The focus on universality rooted in common humanity coupled with statements on non-discrimination found in Articles 2 and 7 demonstrate some commitment to building an international order with greater diversity, equity, and inclusion through strengthening individuals’ rights at a global level. Importantly, however, the transition from collective to individual rights and universal principles has not involved an abandonment of collective or group rights in their entirety. This is evidenced by the co-existence of crimes against humanity and genocide within international law. Crimes against humanity applies to a set of violent acts “when committed as part of a widespread or systematic attack directed against any civilian population, with knowledge of the attack,” whereas genocide requires that the described acts be “committed with intent to destroy, in whole or in part, a national, ethnical, racial or religious group.” As such, crimes against humanity offer more universal and individual-centered protection, while genocide affords group-centered protection. The two work in tandem in that crimes against humanity are sufficiently broad to capture many forms of suffering for any person, while genocide encapsulates a particularly directed form of suffering. Importantly, these concepts create space for individuals’ rights to be recognized and enforced, independent of belonging to a group as well as by belonging to group, while expanding the definition of a ‘group’ beyond the nation or state. This is critically important given the events of WWII, where under the Nuremberg Laws individuals were systematically deprived of their citizenship and the rights that citizenship ensured. The statelessness of Jewish peoples rendered their community largely unprotected in a state-centered international legal regime concerned with the preservation of sovereignty and its related principle of non-intervention. The 1954 Convention relating to the Status of Stateless Persons and the 1961 Convention on the Reduction of Statelessness sought to remedy this problem by ensuring the human rights of stateless individuals and the right of every person to a nationality respectively. Taking up the cause of human rights also offered great powers/former colonizers the opportunity to address issues arising during decolonization such as minority rights and national self-determination, in a manner which did not require specific or binding commitments and was therefore more preferential to their contemporary interests. All of this is not to say that prior to the codification of these laws individual protections in international law were non-existent. A tradition of holding individuals accountable at the international level had in fact emerged as is evident in the example of piracy and the Laws of the Sea, which allowed the prosecution of private individuals and entities as early as the 18th century. The crucial difference here is that these laws were concerned with the protection of private rather than public rights. Consequently, the development of human rights, crimes against humanity, and genocide are significant because they forefront the public rights and treatment of individuals as a matter of international law. In doing so, questions of sovereignty arise in regards to the enforcement of these principles such as when and by who is intervention acceptable in the case of their violation. Three broad dimensions of sovereignty arise from these definitions: authority, territoriality, and recognition. Authority stands out as the central component, with territoriality and recognition being supportive or legitimating characteristics of authority. Non-interference, another oft-named characteristic, involves not violating the components comprising a state’s authority. For a state, authority is directly linked to the ability to set rights and rules and the capacity to uphold them. Therefore, what is also common throughout each of these potential definitions of sovereignty is that, conceptually, sovereignty is contingent upon the definition and structure of rights within the community to which it applies. As such, the history of rights outlined prior is concurrently a history of sovereignty. The transitional spectrum to highlight here is the movement from dynastic to popular sovereignty. Under dynastic sovereignty, sovereignty and the authority it denotes is invested in an individual, the ruler, whereas under popular sovereignty this is distributed among the citizens. The relationship between rights and sovereignty in its popular orientation is most clearly elucidated in the American Declaration of Independence where it proclaims that “…to secure these rights, governments are instituted among men, deriving their just powers from the consent of the governed…,” demonstrating the shift of authority from a ruler to the people and their representation in government. This principle is also enshrined in Article 21(3) of the UDHR which affirms individuals’ right to participate in their country’s government, asserting that “the will of the people shall be the basis of the authority of the government”. Such examples clearly demonstrate that the shifts in prominence from collective to individual rights and dynastic to popular sovereignty were mutually substantive processes because the reconstitution of rights is inextricably linked to the reconfiguration of authority. This idea is particularly interesting in consideration of more modern transitions of sovereignty and the conditions under which authority did and did not transfer. For example, the inability of developing countries to self-govern was used as both a justification for colonization and for the denial of sovereignty at the onset of decolonization precisely because of the linkages between authority and rights. Colonies were viewed as incapable of being sovereign due to being ‘uncivilized’ — lacking in development and in turn, the capacity to ensure rights. This logic also underscores the arguments rooted in natural law which were historically used to deprive indigenous communities of sovereignty and, therefore, land rights. It also demonstrates how standards pertaining to rights and development are historically part of a criterion for the recognition aspect of sovereignty, particularly in its international legal form, which determines whether or not a state can participate in the prevailing international order. Here, individuals are given the formal legal right to intervene in their state should it fail to uphold their rights, further securing the notion that authority and by extension, sovereignty is contingent on the structure of rights and their fulfillment. With the shifts in emphasis to individual rights and popular sovereignty, individuals have therefore not only become the central subjects and governors of rights and sovereignty, but important figures in justifying domestic or international intervention. Central to the justification of intervention under international law is the criteria by which we evaluate states as threats to international security and in turn, when it is acceptable to contravene the non-interference aspect of sovereignty. I contend that these criteria are determined by the parameters of sovereignty and the rights upon which it rests. As the emphasis within international law has shifted towards individual rights, compliance with human rights has become a central component of this criteria. Given the basis of international legal sovereignty on recognition, where a state does not comply with human rights or other international norms, it increasingly risks compromising its sovereignty. Perhaps the most significant benchmark for state recognition is acceptance to the UN, so it is unsurprising that commitments to “conformity with the principles of justice and international law” and “respect for human rights and for fundamental freedoms” feature prominently in Article 1 of the UN Charter as well as throughout the document. The foregrounding of human rights communicates that a state’s access to participation in the prevailing international order, and therefore its international legal sovereignty, has become dependent on its recognition and fulfillment of individual rights. Accordingly, commitments to individual rights are now integral to the norms of engagement set forth by international community for its members. At a more fundamental level, if a state fails to uphold the rights of its citizens — domestic norms of engagement — it is ultimately undermining its authority, and by extension its sovereignty. This is most true where sovereignty is popular and the state derives authority from the consensual agreement of the public to a Hobbesian social contract in which freedom and power are exchanged for rights and order. In this way, where non-compliance occurs authoritative legitimacy may be weakened both domestically and internationally leading to the erosion of sovereignty and emergence of security threats. The terms ‘fragile’ or ‘failed’ state are often used to describe such situations, and although these labels only gained traction in recent history through the trend towards measuring state capacity (often using metrics based on human rights-fulfillment) in international organizations such as the OECD or World Bank, there are numerous historical antecedents for the concept of identifying states which do not meet the standards prescribed by an international order. This passage is significant for several reasons. First, it describes a state which does not comply with international law as an ‘infringer of the public peace’; this harkens of modern views which consider failed states to be a threat to international security. Second, it affirms that this state should undergo the treaty-prescribed punishment, in this context, intervention. Third, and crucially, however, it mandates that this can only happen in circumstances “without the ordinary Course of Justice” or after other options have been exhausted, a key feature of Just War Theory as well as R2P that later emerge as guiding principles regarding intervention. Furthermore, the following articles outline a shared responsibility of the treaty’s signatories to enforce its principles through intervention, an idea bearing considerable likeness to the doctrine of collective security which was integral to the League of Nations Covenant. Additionally, it suggests an international responsibility to intervene where international legal norms are violated. The development of these ideas and their incorporation into the normative landscape surrounding intervention has informed attempts to create international legal frameworks which define the conditions under which intervention is accepted and justified. The most recent and prolific among these being the Responsibility to Protect, which was conceived of by the International Commission on Intervention and State Sovereignty (ICISS) in 2001 in response to problems related to the international community’s intervention in Somalia, Bosnia, and Kosovo as well its failure to do so in Rwanda. In the ICISS report, R2P involves three elements: the responsibility to prevent — to address the root and direct causes of conflict; the responsibility to react — to respond to situations of ‘compelling human need’ with non-violent coercive measures and military intervention if necessary; and the responsibility to rebuild — to assist with recovery, reconstruction and reconciliation in order to treat the issues which initially warranted intervention and prevent future crises. Notably, the resolution did not discuss the responsibility to rebuild, and it is understandable why it may have been considered too contentious to include. A level of pessimism exists concerning the potential enabling effects of this principle and intentions of its supporters; to some, “R2P looks like nothing so much as the return of the civilizing mission and the ‘humanitarian interventions’ of previous centuries.” This argument is limited, however, by its assumption that intervention would follow the course of previous experiences in which powerful states did undermine the sovereignty and capacity of others to their own benefit under guises like colonialism, specific instances of ‘humanitarian intervention’ (i.e. Iraq War), or even neoliberal development policies. Dismissing R2P on these grounds is problematic for several reasons. Firstly, in the initial ICISS report, it repeatedly stresses that “prevention is the single most important dimension of the responsibility to protect.” Francis Deng, the Sudanese UN Ambassador who first conceived of ‘sovereignty as responsibility’, was not focused on military intervention, but rather was concerned with “prevent[ing] the kind of state breakdown that had led to such high levels of internal displacement in some African states” and hindering the use of sovereignty as a shield to deflect intervention. Post-conflict reconstruction, as outlined in the responsibility to rebuild, is essential in order to re-establish human security and prevent conflict from reoccurring. With cognizance of the mutually substantive relationship between capacity, rights, authority, and sovereignty, prevention through reconstruction efforts, where directed towards developing independence via local capacity-building, will strengthen the authority and sovereignty of the state. Further to this point, if the adoption of the responsibility to protect was truly for the purpose of “enshrining a new approach to sovereignty within the UN itself,” failing to adequately address prevention and rebuilding inhibits this goal. It causes us to overlook the normative shift in the nature of rights and sovereignty outlined in this paper which demonstrate a change in the rights-defined responsibilities associated with sovereignty and, therefore, the limits of sovereignty itself which dictate when intervention is acceptable. Lastly, repudiating R2P in this manner does not challenge us to reconsider the meaning of intervention and work towards redefining it to encapsulate more effective practices. R2P and its recommendations are rooted in improving human security as a means of preventing conflict. As an approach centered on human rights, it is congruent with the normatively dominant notions of individual rights-based authority and sovereignty. Given the established relationship between state capacity and human rights compliance, further studies should be conducted to determine effective and practical forms of increasing human security and independence through local capacity-building. This may even provide insight as to more effective and less exploitative methods of engaging in international development; ones which do not perpetuate global inequalities or disparate power relations among states in the long run. It also encourages us to look beyond military intervention, which has brought the most controversy to the concept of R2P. Since it is also recognized that donors to post-conflict reconstruction “are most likely to achieve reconstruction goals in countries where they have the least at stake,” it also opens new space to consider the role of the UN or other IOs as more neutral arbitrators of this process. Efforts should also be made to expand the treatment of sovereignty and intervention in international law. The emerging concept of suspended sovereignty may be useful to typify situations where sovereignty is compromised due to deteriorating authority such as in the case of failed states, and to mandate intervention. Moreover, considering the formation of a jus post bellum component of international humanitarian law could be a useful elaboration in terms of requiring a commitment to rebuilding in order for an intervention to be legally justified and in answering the question of who bears responsibility to facilitate these efforts. Given that what constitutes a justified intervention is mainly a legal question constrained by sovereignty, it follows that as international law has become increasingly focused on individual rights, recognition of sovereignty and its limitations within international law has become premised on compliance with these rights. Intervention becoming acceptable where non-compliance occurs. Adopting this logic, there is a responsibility to intervene where the international legal sovereignty of a state is being compromised through the violation of individuals’ rights and equally, the responsibility to rebuild a state’s capacity to uphold its citizens rights in order to strengthen or restore its international legal sovereignty. Conceptions of sovereignty and its limits have been in flux throughout history and continue to be in the present day. By examining the interconnection between the shifts in emphasis from collective to individual rights and dynastic to popular sovereignty, this paper has sought to demonstrate that sovereignty and its limits are contingent on the structure of rights and proceeding definition of authority within states. It argues that with the growing acceptance and integration of individual rights in international law, legal norms around sovereignty and intervention have too changed, with compliance to international norms such as human rights becoming a part of the criteria for evaluating just intervention. The focus of this analysis is on the development of sovereignty and rights through historical events pertaining to formation of international law and the order it espouses. As such, it is limited by its concentration on mainly European and North American events and ideas, informed by the distribution of power within the order itself. Moving forward, further research should be conducted on how rights and sovereignty were conceived of in countries or social groupings exterior to the global north, prior to the Peace of Westphalia, and preceding integration to the international system. This is presently a significant gap in scholarship and expanding the literature to fill it would perhaps reduce the Western and democratic bias of analyses allowing us to make assessments that can be more accurately applied to other systems of governance. As this paper has highlighted, there is considerable room for re-evaluation of the conceptual and practical approaches by which we address the numerous and highly complex challenges in international relations. This is a highly necessary undertaking. As the conditions of the world evolve, so too do its challenges, and therefore, our conceptual apparatuses must account for this by adapting past principles to contemporary concepts in order to provide effective direction. History may rhyme, but it is the responsibility of each generation to ensure that the worst does not repeat. Sarah Ingle (@SarahLMIngle) is a student at Trinity College, University of Toronto in International Relations, Digital Humanities and Political Science and Founder of the Youth Internet Governance Forum in Canada. She is interested in the impacts of digitization and data on governance, human security, and rights in the Internet age. Philippe Sands, East West Street (Place of Publication Not Identified: Weidenfeld & Nicolson, 2017). 57. Daria Jarczewska, “Do Human Rights Challenge State Sovereignty?” E-International Relations, March 15, 2013, , accessed March 22, 2018, http://www.e-ir.info/2013/03/15/do-human-rights-challenge-state-sovereignty/. Derek Croxton, “The Peace of Westphalia of 1648 and the Origins of Sovereignty,” The International History Review 21, no. 3 (1999): , doi:10.1080/07075332.1999.9640869., 575. The Editors of Encyclopaedia Britannica, “Declaration of the Rights of Man and of the Citizen,” Encyclopædia Britannica, December 15, 2017, , accessed March 22, 2018, https://www.britannica.com/topic/Declaration-of-the-Rights-of-Man-and-of-the-Citizen. The Editors of Encyclopaedia Britannica, “Declaration of Independence,” Encyclopædia Britannica, March 16, 2018, , accessed March 22, 2018, https://www.britannica.com/topic/Declaration-of-Independence. Micheline Ishay, The History of Human Rights: From Ancient times to the Globalization Era (Berkeley, Califordnia: University of California Press, 2009),19. “Universal Declaration of Human Rights,” Avalon Project, 1948,, accessed March 22, 2018, http://avalon.law.yale.edu/20th_century/unrights.asp. “Crimes Against Humanity,” United Nations Office on Genocide Prevention and the Responsibility to Protect, , accessed March 22, 2018, http://www.un.org/en/genocideprevention/crimes-against-humanity.html. “Genocide,” United Nations Office on Genocide Prevention and the Responsibility to Protect, , accessed March 22, 2018, http://www.un.org/en/genocideprevention/genocide.html. Michael Berenbaum, “Nürnberg Laws,” Encyclopædia Britannica, May 03, 2017, , accessed March 22, 2018, https://www.britannica.com/topic/Nurnberg-Laws. United Nations, “UN Conventions on Statelessness,” UNHCR, accessed March 22, 2018, http://www.unhcr.org/un-conventions-on-statelessness.html. Mark Mazower, “The Strange Triumph Of Human Rights, 1933-1950,” The Historical Journal 47, no. 2 (2004): , doi:10.1017/s0018246x04003723. “Piracy – International Law,” Oxford Bibliographies, May 25, 2016, , accessed March 22, 2018, http://www.oxfordbibliographies.com/view/document/obo-9780199796953/obo-9780199796953-0026.xml. Stephen D. Krasner, Sovereignty Organized Hypocrisy (Princeton: Princeton University Press, 2001), 9. “Declaration of Independence, July 4, 1776,” Avalon Project, 1776, , accessed March 22, 2018, http://avalon.law.yale.edu/18th_century/declare.asp. Article 21.3,”Universal Declaration of Human Rights,” Avalon Project, 1948,, accessed March 22, 2018, http://avalon.law.yale.edu/20th_century/unrights.asp. Edward Keene, Beyond the Anarchical Society: Grotius, Colonialism and Order in World Politics (Cambridge, UK: Cambridge University Press, 2002). “Declaration of the Rights of Man,” Avalon Project, 1789, , accessed March 22, 2018, http://avalon.law.yale.edu/18th_century/rightsof.asp. Article 1.1, “Charter of the United Nations,” Avalon Project, June 26, 1945, , accessed March 22, 2018, http://avalon.law.yale.edu/20th_century/unchart.asp. Article 1.3, “Charter of the United Nations,” Avalon Project, June 26, 1945, , accessed March 22, 2018, http://avalon.law.yale.edu/20th_century/unchart.asp. Olivier Nay, “International Organisations and the Production of Hegemonic Knowledge: How the World Bank and Theoecdhelped Invent the Fragile State Concept,” Third World Quarterly 35, no. 2 (2014): , doi:10.1080/01436597.2014.878128. “Treaty of Westphalia,” Avalon Project, 1648, , accessed March 22, 2018, http://avalon.law.yale.edu/17th_century/westphal.asp. For example, Article CXXIII states,“all Partys in this Transaction shall be oblig’d to defend and protect all and every Article of this Peace against any one”. “The Responsibility to Protect: Report of the International Commission on Intervention and State Sovereignty,” Responsibility to Protect, December 2001, , accessed March 22, 2018, http://responsibilitytoprotect.org/ICISS Report.pdf. XI. United Nations, General Assembly, Resolution Adopted by the General Assembly on 16 September 2005: 60/1. 2005 World Summit Outcome, October 24, 2005, , accessed March 22, 2018, http://www.un.org/en/development/desa/population/migration/generalassembly/docs/globalcompact/A_RES_60_1.pdf. 30. Mark Mazower, Governing the World: The Rise and Fall of an Idea (London: Allen Lane, 2012.) 395. Mark Mazower, Governing the World: The Rise and Fall of an Idea (London: Allen Lane, 2012.) 389-391. Includes peace building, justice and reconciliation, and development. “The Responsibility to Protect: Report of the International Commission on Intervention and State Sovereignty,” Responsibility to Protect, December 2001, , accessed March 22, 2018, http://responsibilitytoprotect.org/ICISS Report.pdf. 39-45. Mark Mazower, Governing the World: The Rise and Fall of an Idea (London: Allen Lane, 2012.) 388. Wade M. Cole, “Mind the gap: State capacity and the implementation of human rights treaties.” International Organization 69, no. 2 (2015): 405-441. “The Lessons of Libya,” The Economist, May 21, 2011, , accessed March 22, 2018, https://www.economist.com/node/18709571. Desha Girod, Explaining Post-Conflict Reconstruction. New York: Oxford University Press, 2015. Oxford Scholarship Online, 2015. doi: 10.1093/acprof:oso/9780199387861.001.0001. A. Yannis, “The Concept of Suspended Sovereignty in International Law and Its Implications in International Politics,” European Journal of International Law 13, no. 5 (2002): , doi:10.1093/ejil/13.5.1037. James Pattison,”Jus Post Bellum and the responsibility to rebuild.” British Journal of Political Science 45, no. 3 (2015): 635. Peter Hilpold, “Jus Post Bellum and the Responsibility to Rebuild,” SSRN Electronic Journal, 2014, , doi:10.2139/ssrn.2443272. Berenbaum, Michael. “Nürnberg Laws.” Encyclopædia Britannica. May 03, 2017. Accessed March 22, 2018. https://www.britannica.com/topic/Nurnberg-Laws. Britannica, The Editors of Encyclopaedia. “Declaration of the Rights of Man and of the Citizen.” Encyclopædia Britannica. December 15, 2017. Accessed March 22, 2018. https://www.britannica.com/topic/Declaration-of-the-Rights-of-Man-and-of-the-Citizen. Britannica, The Editors of Encyclopaedia. “Declaration of Independence.” Encyclopædia Britannica. March 16, 2018. Accessed March 22, 2018. https://www.britannica.com/topic/Declaration-of-Independence. “Charter of the United Nations.” Avalon Project. June 26, 1945. Accessed March 22, 2018. http://avalon.law.yale.edu/20th_century/unchart.asp. Cole, Wade M. “Mind the gap: State capacity and the implementation of human rights treaties.” International Organization 69, no. 2 (2015): 405-441. “Crimes Against Humanity.” United Nations Office on Genocide Prevention and the Responsibility to Protect. Accessed March 22, 2018. http://www.un.org/en/genocideprevention/crimes-against-humanity.html. Croxton, Derek. “The Peace of Westphalia of 1648 and the Origins of Sovereignty.” The International History Review21, no. 3 (1999): 569-91. doi:10.1080/07075332.1999.9640869. “Declaration of Independence, July 4, 1776.” Avalon Project. 1776. Accessed March 22, 2018. http://avalon.law.yale.edu/18th_century/declare.asp. “Declaration of the Rights of Man.” Avalon Project. 1789. Accessed March 22, 2018. http://avalon.law.yale.edu/18th_century/rightsof.asp. “Genocide.” United Nations Office on Genocide Prevention and the Responsibility to Protect. Accessed March 22, 2018. http://www.un.org/en/genocideprevention/genocide.html. Girod, Desha. Explaining Post-Conflict Reconstruction. New York: Oxford University Press, 2015. Oxford Scholarship Online, 2015. doi: 10.1093/acprof:oso/9780199387861.001.0001. Hilpold, Peter. “Jus Post Bellum and the Responsibility to Rebuild.” SSRN Electronic Journal, 2014. doi:10.2139/ssrn.2443272. Ishay, Micheline. The History of Human Rights: From Ancient times to the Globalization Era. Berkeley, Calif.: University of California Press, 2009. Jarczewska, Daria. “Do Human Rights Challenge State Sovereignty?” E-International Relations. March 15, 2013. Accessed March 22, 2018. http://www.e-ir.info/2013/03/15/do-human-rights-challenge-state-sovereignty/. Keene, Edward. Beyond the Anarchical Society: Grotius, Colonialism and Order in World Politics. Cambridge, UK: Cambridge University Press, 2002. Krasner, Stephen D. Sovereignty Organized Hypocrisy. Princeton: Princeton University Press, 2001. Mazower, Mark. “The Strange Triumph Of Human Rights, 1933-1950.” The Historical Journal47, no. 2 (2004): 379-98. doi:10.1017/s0018246x04003723. Mazower, Mark. Governing the World: The Rise and Fall of an Idea. London: Allen Lane, 2012. Nay, Olivier. “International Organisations and the Production of Hegemonic Knowledge: How the World Bank and Theoecdhelped Invent the Fragile State Concept.” Third World Quarterly35, no. 2 (2014): 210-31. doi:10.1080/01436597.2014.878128. Pattison, James. “Jus Post Bellum and the responsibility to rebuild.” British Journal of Political Science 45, no. 3 (2015): 635. “Piracy – International Law.” Oxford Bibliographies. May 25, 2016. Accessed March 22, 2018. http://www.oxfordbibliographies.com/view/document/obo-9780199796953/obo-9780199796953-0026.xml. United Nations. General Assembly. Resolution Adopted by the General Assembly on 16 September 2005: 60/1. 2005 World Summit Outcome.October 24, 2005. Accessed March 22, 2018. http://www.un.org/en/development/desa/population/migration/generalassembly/docs/globalcompact/A_RES_60_1.pdf. Sands, Philippe. East West Street. Place of Publication Not Identified: Weidenfeld & Nicolson, 2017. “The Lessons of Libya.” The Economist. May 21, 2011. Accessed March 22, 2018. https://www.economist.com/node/18709571. “The Responsibility to Protect: Report of the International Commission on Intervention and State Sovereignty.” Responsibility to Protect. December 2001. Accessed March 22, 2018. http://responsibilitytoprotect.org/ICISS Report.pdf. “Treaty of Westphalia.” Avalon Project. 1648. Accessed March 22, 2018. http://avalon.law.yale.edu/17th_century/westphal.asp. United Nations. “UN Conventions on Statelessness.” UNHCR. Accessed March 22, 2018. http://www.unhcr.org/un-conventions-on-statelessness.html. “Universal Declaration of Human Rights.” Avalon Project. 1948. Accessed March 22, 2018. http://avalon.law.yale.edu/20th_century/unrights.asp. Yannis, A. “The Concept of Suspended Sovereignty in International Law and Its Implications in International Politics.” European Journal of International Law13, no. 5 (2002): 1037-052. doi:10.1093/ejil/13.5.1037.